According to Alisdair McGregor, Liberal Democrat prospective parliamentary candidate for the Calder Valley, HS2 is ‘the biggest Green project going, because it’s about freeing up freight capacity’. The busiest section of the West Coast Main Line is the section between London and Rugby. On that section, there are four tracks (Up Fast, Up Slow, Down Fast, and Down Slow). In normal service, intercity passenger trains use the Fast lines. Freight and most Commuter traffic uses the Slow lines. HS2 is envisaged as a passenger-only two-track railway, for use by long distance trains. As such, it does not provide increased railfreight capacity on its own track, or on the existing West Coast track. Currently, about half the available freight paths on the WCML are not used (i.e., wasted). As can be seen from chief engineer Andrew McNaughton’s presentation (above), HS2’s modelling does not envisage a fall in the number of passenger services using the Slow lines. Therefore, so far as can be established, the number of additional freight paths arising from HS2 would be zero. At the ‘Next Generation Rail’ conference in December 2014, Cheshire East council leader Michael Jones explained how the HS2 railway would help people live long, and prosper. Q: What are the benefits of a fully integrated transport system on societal concerns such as public health? [Michael Jones]: Believe it or not, there will be a very strong link between HS2 and public health. We’re in the situation where we have women (in Cheshire East) with a life expectancy of 57. Less than 30 miles away, it’s 72. That’s one of the highest discrepancies in the country. Granted, the current life expectancy has risen from 52 in the last three years, but if we continue to focus on low employment, getting people educated and giving them wealth – all things that come with the HS2, then we can expect to see big change. If the HS2 railway were built into London’s Euston station, there would be a reduction in the number of platforms available for use by trains using the existing tracks, HS2 chief engineer Professor Andrew McNaughton told the High Speed Rail Bill Committee on 15 February 2015. […] But, [in 2026 the Euston classic platforms] are now being used for […] new services, which don’t take so long to turn around. A train from Glasgow spends 40 minutes being cleaned, victualled, watered, before it disappears off north again. So, it uses a platform for a very long time. A commuter train from Milton Keynes comes in, decants everybody, puts more people on, disappears off in five or six minutes. So, the mix of train services does affect the number of platforms you need, as well. But as can be seen from Prof McNaughton’s slide #13 (below), HS2’s proposed re-mix of the West Coast route does not feature dedicated Fast line commuter trains terminating at Milton Keynes. All the Fast line services would run on to Northamptonshire or beyond (in some cases, well beyond). According to the Department for Transport, most of the Fast line trains would be operated by Class 350 (or similar) units. These have a lower top speed than the Pendolino or IEP designs. So it seems likely that journey times on West Coast would tend to increase, rather than decrease. At present, most peak London Midland Euston trains are short-length, which suggests a continuing insufficiency of rolling stock. The number of Class 350 (actual or ersatz) required to operate the Professor’s re-mix is unclear, but seems likely to be considerably in excess of what currently exists. The Cambridge guided busway — built on the old St Ives railway trackbed — has seen 11 million passengers since opening four years ago, but has been plagued with defects, the Wisbech Standard reported (10 April 2015). A technical report six months ago said the busway, which was built by contractor BAM Nuttall, had £31 million worth of defects – in some places the track has risen four inches – which need to be addressed to tackle the “deteriorating” ride quality. […] Speaking to BBC Radio Cambridgeshire, Bob Menzies, service director for strategy and development at Cambridgeshire County Council, said they may be forced to put rubber pads under every beam of the track. […] The council instigated the review into the contract after the project ran into problems and delays, resulting in BAM Nuttall, repaying £33million of the £147m costs to settle a long-running dispute about who should pay for the overspend for the concrete route. Like the HS2 scheme and the Borders Railway, the Cambridge busway is ‘political’ infrastructure. Its biggest defect lies in the concept, rather than the execution. The concrete guideway is little more than a very expensive way of stopping normal road traffic using the right-of-way. Had the old St Ives railway been rebuilt as a conventional road, there would have at least been the possibility of bicycles, and emergency vehicles, being able to use it. In general, reserved track transport schemes — bus or rail — tend to require high levels of demand to be worthwhile. According to its website, Steer Davies Gleave ‘co-ordinated a multi-disciplinary PPP team, to develop a robust scheme for the Cambridge Guided Busway from conception through to scheme design’, but what has been provided could hardly be described as robust. Perhaps BAM Nuttall are not the only ones who have questions to answer. […] Steer Davies Gleave guided the evolution of the project from a private sector developer promoted project, to a joint public/private project with the powers sought by Cambridgeshire County Council. Steer Davies Gleave’s management of the team meant that we were able to develop a robust scheme within the extremely tight timeframes. Our expertise in technical issues and an understanding of the political sensitivities and requirements ensured that the right solution we developed. The project director for Cambridge summarised SDG’s input as “at all times professional and undertaken to an extremely high standard. The particular strengths were creativity, problem solving and project management”. 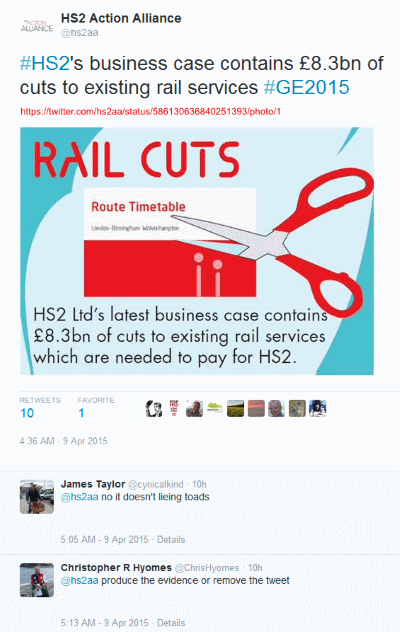 What are the HS2 classic line savings? Is HS2 technical director Andrew McNaughton’s ‘illustrative representation’ of West Coast train services in HS2 phase one, compatible with claimed net savings of £5.67 billion?